Opening day of youth baseball, and a man steps onto the field, broadcasting on social media. He asks his audience a simple question: who to kill first? What happens next will shake Creek County to its core. Veiled by anonymity, the killer isn’t even close to done. He tells his audience to stay tuned for more. Detective Mallory Black and her partner, Mike Cortez, find themselves racing against time to unravel the secrets of a killer lurking in the shadows before he can strike again. But how do you find a killer cloaked in anonymity? Meanwhile, vigilante Jasper Parish undertakes his most personal quest yet as he attempts to deliver justice to the people who destroyed his world. As his secrets come to light, his daughter begs him to stand down. Jasper doesn’t stand down for anyone, though. He’s on a path, and he refuses to back down. Because when you cross Jasper Parish, there is no escaping his vengeance. 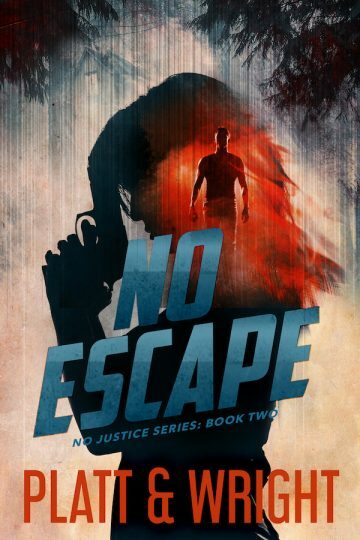 No Escape is the second book in the No Justice thriller series from bestselling authors Sean Platt and David Wright.